This article needs a screenshot of gameplay. It's always a good thing for visitors to be able to SEE a fangame rather than just read about one. If possible, upload a screenshot of gameplay. See Help:Image Formatting if you need advice. Super Mario: All-Star Attack was named Game of the Month in July 2015. 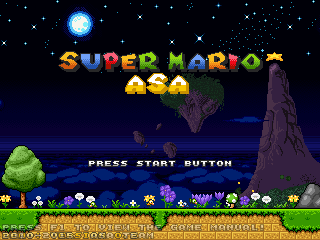 Super Mario: All-Star Attack (commonly abbreviated as SM: ASA) (Also known as Super Mario World: All-Star Edition) is a fangame created by ASE Team (~CaMtEnDo~, Mikeystar, StrikeForcer, Karate Cat, GamePixel, Neweegee, Mors, Geoshi and Gatete.) It was at first developed with Hello Engine 4. It is now currently being developed with a custom engine. "The All-Star is the progenitor of the Starman, which grants it's granting powers, and which grants its luminescence. The Starman can exist independently, but over time, they become scarce. The All-Star has tremendous, incomprehensible power, that anyone who controls the All-Star is granted eternal life, unlimited wishing power, and can warp landscapes to their own image. It is said that only a true hero can defeat someone under the influence of the All-Star, if the All-Star was to fall to a darker force. Present-day, tired of his many defeats at the hands of the Mario Bros., the Koopa King, Bowser, decides to steal the All-Star to conquer the Mushroom World. He, and Kammy Koopa and Kamek set out to Star Haven. They use the power of Kammy's dark magic, and take off with the All-Star. When Bowser harnessed the power of the All-Star, it warped Dark Land and Pipe Maze into the more fortified Koopa Core and the transformed Bowser Facilities for Bowser's personal kingdom and its capital, Transport Conduit, under the Koopa Kingdom's jurisdiction. He then sundered the All-Star into 8 fragments, referred to as Star Shards, for him and the Koopalings to use. The Koopalings then proceeded to conquer the seven kingdoms of Mushroom World by abusing the power of the Star Shards and creating their strongholds to their own tastes. When news of the recent invasion of Mushroom World and the transformation of the landscape reached the Mario Bros., heroes Mario and Luigi set out to liberate the conquered territories, and defeat King Bowser Koopa once and for all. The Mario Bros. will need all the help they can get. Toad, Princess Peach, and eventually, Wario, join them on their quest to defeat Bowser and return the All-Star to it's rightful place, which Bowser plans to use to complete the transformation of the Mushroom World into his own powerful, dark kingdom." Compared to a more familiar control scheme, the arrow keys serve as the directional pad, with SHIFT and CTRL serving as A and B respectively. ENTER is START, and SPACE is SELECT. Special jumps can be performed by pressing the up arrow key and SHIFT at the same time, or, by holding the DOWN button. Characters like Wario play quite differently from the others, with exclusives moves and attacks, but their controls remain largely the same. The game features as many enemies from various Mario titles as could be programmed, as well as several crossover enemies from different game series. Each playable character in SM: ASA has several unique power-ups. Power-ups are available to be bought through the use of several towns in the game. The Power-up list can be seen here. The game features updated 16-bit graphics, accurate physics, Yoshi, several different power-ups that vary by character, 8 playable characters (Mario, Luigi, Toad, Princess Peach, Wario, Sonic the Hedgehog, Retro Mario, and Retro Luigi. ), 10 various worlds, well-constructed levels, several mounts including 4 different Kuribo Shoes, Marine Pop and Sky Pop levels, a more serious storyline, swappable character skins, a wide variety of enemies, throwbacks to the 8-bit era of gaming, an OGG soundtrack which can also be customized, intense boss battles, and a lot more. Each Koopaling (asides from Bowser Jr.) wields a wand crafted from a Star Shard. Many past bosses make a triumphant reappearance, but there are numerous new entries to combat. A colossal Koopa Troopa sporting a slick black shell and shades, who stomps about and spins in his shell to attack. An armored, huge Dry Bones, clad in spikes, who has a bone-chilling breath that can freeze you solid. A giant Pidgit who swoops down to attack. A buffed-up Bro., transformed by a Star Shard, who has a wide array of attacks and machines, and is one of Bowser's latest elites. ...and several other bosses that have not been confirmed as of yet. Some of the appearing bosses are from the original (now scrapped) build of Goombaking123's fangame Ultra Mario Bros., and were sprited by Karate Cat (of the ASE Team), so at the idea of being trashed, the bosses were relocated to All-Star Attack. Super Mario: All-Star Attack was first announced on August 29, 2010, where it was called Super Mario Bros. Ultra. It then got a new topic on the current forums with its current name. A reactor was also created for it, which was then deleted. The temporary reactor was later moved to the the NEW Official Super Mario World: ASE Reactor. The topic on the Super Mario 2012 boards. The topic on the MFGG forums. The topic on the old MFGG forums. The original topic, when the fangame was called Super Mario Bros. Ultra. The Official Super Mario World: ASE Reactor.